Pallet collars are pallet sized collars that are hinged box sides. They’re used for storing stuff on pallets. I’d seen some on a plot, but it was only when I discovered one labelled as a pallet collar on the internet that I realised where I might find some. My local pallet yard sold me some at £6 each which was cheaper than me building a raised bed from wood, and definitely easier than the effort of me making raised beds. I used about 8 on my plot. Someone new joined our site and whilst showing him round my plot, he realised he had them at work in the engineering section. So he went and asked nicely and got given a load: A serious load! His source has dried up now unfortunately but not before he’d laid out his allotment how he wanted. I’m a bit jealous as he got his for free – although eh did have to load them into his car and fetch them to site himself, which took several trips. He’s now got an excellent looking plot. He’s filled his boxes with manure and has mixed in some coffee grounds he also gets from the café at work. His seedlings are growing in his plastic greenhouse and will be ready to be planted out soon enough. Thompson and morgan have a great selection of beautiful clematis flowers available. 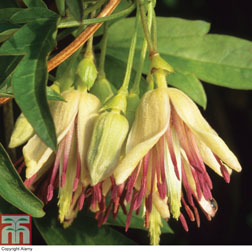 Rare and unusual clematis variety originating from Nepal and parts of China. It loses all its foliage in early summer and remains dormant until the autumn when it puts on lush new foliage which is followed by large clusters of stunning, scented pendulous fl owers. Perfect for dull winter months. Height: 3m (9’). Spread: 15m (5’). Pruning group: 1. Supplied in 7cm pots. How exciting is this? A brand new nasturtian, not yet available in seed. Be amongst the first in the UK to grow this new nasturtian. Nasturtium ‘Fruit Salad’ is so new it’s only available in plant form. Nasturtians are amazing plants that can produce tons of beautiful flowers and leaves. They’re edible too. This type was thought to be lost but is now available to buy this year as plants. 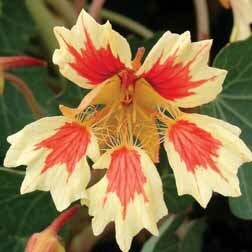 Did you know that these type of nasturtiums existed many years ago, but were lost? It’s great that it’s been possible to re-introduce them as they’re perfect for hanging baskets or pots. What’s even better is they definitely don’t become huge cabbage-like specimens as most nasturtiums do! Have been giving this cold weather some serious thought. If it continues for another month then we will be behind planting things up and sowing seeds. Whilst you can carry on planting it’s really silly to be having to clear snow off the ground before you dig it! 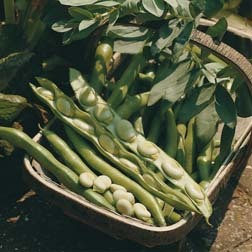 I’ve started some more broad beans in the greenhouse. Crimson flowered and Bunyard’s Exhibition. I did plant some out on the plot back in the autumn but it looks like either the appalling weather or mice got to them. 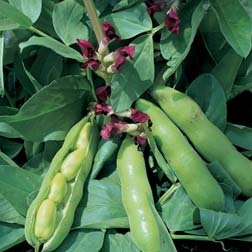 They’re usually very tough plants though and should come up no problem in cold weather. I’m also worried about the bees. They’ve been out and about during the sunshine but they can’t go out when it’s this cold and snowy and so are stuck in. They’ve got extra fondant on but if they are in a tight cluster then they might not get to it when they need it. 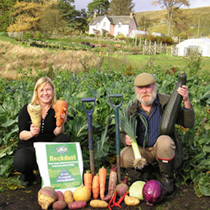 Charles Dowding has been practising no-dig organic growing for over 30 years. In this new, full colour edition of Organic Gardening, he shares the wealth of his experience, explaining his approach to soil and plants and revealing the range of techniques that have enabled him to grow healthy and vibrant plants for decades. His success is based on some key principles: No-dig enhances soil structure and encourages healthy growth; Organic matter is best spread on the surface – just leave it on the top and let the worms take it in, aerating the soil as they do so; When starting with weedy soil there is a period of 3-12 months, depending on weed types, when the emphasis is on cleaning and improving the soil; Using a no-dig method you can easily control weeds with just a little hand weeding or hoeing every ten days or so, when weeds are small. 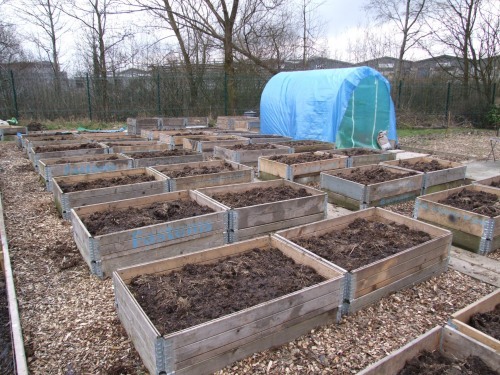 Based on this approach and his experience of a system of permanent, slightly raised beds, Organic Gardening shows you how to grow a delicious variety of fruit and vegetables: what to choose, when to sow, plant and harvest, and how best to avoid pests and diseases without the need to dig. Got a lawn? You could grow potatoes with almost no effort expended at all. You’ll need some old manure, fertiliser, paper and straw. You could use old compost – the stuff he throws on looks very dry and powdery. Very simple and easy to do. Turn your lawn into a potato patch. The slug catching needs to start early this year! Last year was a bad year for gardeners but an excellent one for slugs. The mild wet summer enabled them to grow and reproduce like crazy. This has got me and a few other plot holders concerned. Whilst the idea of spending £20 on nematodes is certainly an option I’d like to try some other techniques for catching them. •	Fake-beer traps. Am going to try using bread yeast to make fake beer to put in traps. •	Application of slug pellets when planting out seedlings. Although if I go the nematode route I won’t need to do this. •	Use of scratchy mulches. This might protect some plants from being attacked. •	Keeping the plot tidy. Slugs will hide in bags and underneath tubs so these need sorting out so there are fewer places to hide. •	Thinking about installing a small pond to welcome frogs and toads. Not sure where to put one so at the moment it’s only at the pre-planning stage. Whilst this might not solve the problem entirely it’s got to help! I do think the removal of slugs by dusk patrols has to be a useful thing to do. Removing large slugs will mean there’s fewer to do damage and reproduce. The advantages of this method are it only costs time and the liquid I drown them in. Liquids which can be used could just be salty water, but I do have some beer yeast water that I am using. Even though it’s only March I have found some slugs on cardboard mulch sheets in the compost area, so they’ve been disposed of. Hopefully by regularly removing the slugs I’ll make a dent in the population. It’ll also be a good excuse to be out on the plot in the evenings. That can be a really lovely time to be out, when the plot is quiet, and when the sky sinks down and the sunsets are worth looking at. 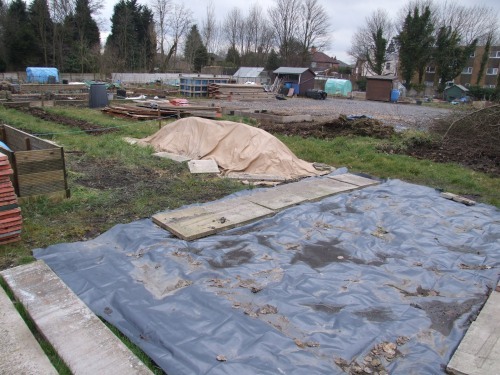 One thing to watch out for is where there are tarps and covers on the ground; these can quickly become a home for slugs. It’s worth checking under any you have on your plot and removing any slugs and snails you find lurking underneath. As you will know the slugs don’t stay under cover at night and will come out and devastate crops. It’s important to encourage other plot holders to also take action against slugs and snails. Perhaps discuss this at your meetings or mention it to the committee to bring up. Slugs don’t just stay on the plot they start on! They’ll feast far afield! Boards, tarps, cardboard, concrete slabs on grass can all be home to slugs. Grass around the edge of raised beds is a good place for slugs to hide from the heat of the day. When hunting them down think cool shady places and you’ll find them. The advantage of hunting them at dusk is the sun is going down so they sneak out to start eating away at the plants! I’m going to admit to a terrible error now – back in the autumn I bught some crocus bulbs. I planted them and then I bought some more. And I put them somewhere and forgot about them. They were uncovered this week and have been planted up. They were quite dry and had started to sprout so they may survive! They’re in a rectangular tub at the moment in the garden! Whoops! Interesting tool – one I’ve not seen before or used. Will have to find out more about this as it looks very intriguing! An amazingly useful tool that’s popular on the continent, but remains so far largely undiscovered in the UK. 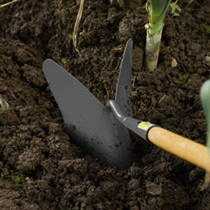 Invaluable in the veg garden for creating furrows for sowing and planting, earthing up, as well as for turning over the soil and mixing in compost or fertiliser. It has a powder coated steel head and a wooden handle with comfy hand grip. Overall length 163cm (65). Colours may vary. Would be good to use on good soil but on lumpy clay it might not be really easy but does look like it’ll be good for earthing up potatoes! Things to make you grow more easily! 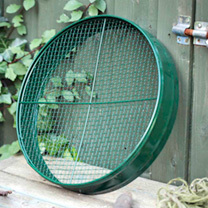 The compost aerator will allow your compost to work more quickly and is less effort than turning the whole heap! The rockdust is recommended by a friend as a must try! And the riddle is essential for getting really great compost from your heap for sowing in! One of the essential elements in quickly generating good quality compost is to provide aerobic conditions for the bacteria that are doing all the hard work. With our compost aerator this is easily achieved. Simply push the tool into the heart of the compost heap, twist and withdraw – as you do so the hinged flaps open, stirring up the material and letting the air in. With an all steel construction, it is a strong, simple device, but very effective. This 420 million year old, freshly crushed, finely ground volcanic dust has been found, in trials, to produce heavier crops with better flavour, higher nutritional content, longer storage life, better pest resistance and improved drought tolerance! Its extremely high mineral content actually improves the health of the soil, and it has also been found to speed up composting and produce better compost. Can be applied at any time of year. One 20kg bag is enough to treat 40msquared of soil. Made in the UK, this steel garden riddle will provide years of faithful service. 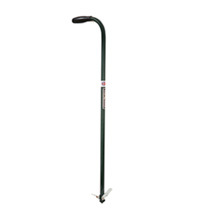 Its the perfect accessory to remove stones from soil, clean gravel for paths and sieve seed compost. Electrostatically sprayed in a mid brunswick green powder and then cured in a gas oven for an attractive and durable finish. 10mm mesh, diameter 35cm.